VOL. II NO. 12 REG NO. L5015 DELHI, FRIDAY DECEMBER 3, 1943. GORGEOUS GALE There are, according to rumors reaching the Roundup, gals like Gale Robbins circulating around a strange land called the United States, of which she is a native. 14TH AIR FORCE HQ. - Striking at a part of the Japanese Empire for the first history-making time from China, Mitchell bombers and long-range fighters carried the air war to Formosa Island in a smashing Thanksgiving Day raid directed against the large air base at Shinchiku. It was hardly a day of Thanksgiving for the enemy, for the raid cost them 46 planes confirmed, while all 14th Air Force and Chinese-American Composite Wing raiders returned safely from the island fortress, 100 miles off the China coast between the Philippines and Japan proper. Lightning fighters led the Allied attack, which caught the Japanese with their pants down with only a few planes off the field. From the very outset, the opposition in the air was knocked out. Then, while enemy planes were frantically trying to get off the ground, Mitchell bombers followed by covering the airdrome and installations with fragmentation bombs in a low-level attack. Other American pursuits covered the B-25's over the target, shooting down two intercepting Zeros from behind the bomber formation before strafing the field on their own. The final tally of the raid stood at 14 confirmed in the air by pursuits, one shot down by the B-25's and 31 destroyed on the ground. The bag included a Stuka dive bomber and two Junkers-52 transports. Teddy White, Time & Life correspondent and the only pressman to accompany the raiders, described the blow as a "complete surprise." "It was a peaceful, sunny afternoon," he said, "and Japanese transports and bombers were circling the field in slow traffic patterns. The P-38's struck the planes before any Jap was aware the raid was on. They plummeted into the sea, smoking, and the P-38's went on to blitz the parked airplanes on ramps and runways and to drive the terrified ground personnel all the way across the field. The B-25's followed hard at startling new low levels in a rigid echelon extending a mile and a half to the right. The fragmentation bombs cut a swath of destruction across the field, the runway, through the barracks and hangars, literally shattering all essential Japanese installations." Unscathed except for a few minor bullet holes in three Mitchells from ground fire, the raiders returned to their home base too late to get their turkey dinner, but no one complained too vociferously after the satisfying success of the raid. It was significant that the raid, which extended the sweep of operations closer to Tokyo, was carried out by medium bombers and not by loner-ranged B-24's. Crews reported that Shinchiku Airdrome, which is in the northeastern corner of Formosa, was covered with smoke from many blazing planes and buildings as the raid ended. Shinchiku is only 560 miles from the southernmost of the Japanese home islands. Col. Clinton (Casey) Vincent, commander of the 14th Air Force Forward Echelon, planned and directed the raid. 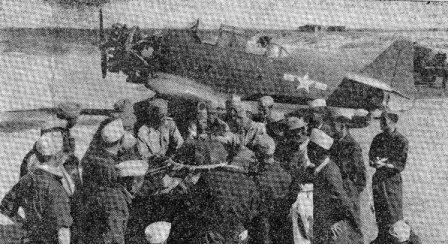 Lt. Col. David (Tex) Hill, former AVG ace who recently returned to China, arrived just in time to swell his decisions to 18 by confirming one bomber in the air and another on the ground. Capt. Sam Palmer, leading another fighter outfit, knocked down three enemy planes. The 14th Air Force Mitchells were led by Lt. Col. Joseph B. Welles, while Lt. Col. Irving Branch commanded the Mitchells of the mixed Chinese-American Wing. The Japanese are known to be using Formosa as a training and staging ground for aircraft sent to China, Southeast Asia and the Southwest Pacific, as well as a troop supply concentration base on the vital sea route. EGYPT - A flood of rumors which raced like wildfire through the world all during the week gained confirmation today with the official announcement that President Roosevelt, Winston Churchill and Chiang Kai-shek have just concluded an important conference on Asiatic affairs, military and diplomatic, somewhere in North Africa. Though not officially announced, newspaper dispatches say the Big Three will now move into the Middle East, probably to Tehran in Iran (Persia), for the first meeting of the war of Allied chiefs to be attended in person by Russia's Marshal Josef Stalin. "The several military missions have agreed upon future military operations against Japan. The three great Allies expressed their resolve to bring unrelenting pressure against their brutal enemies by sea, land and air. This pressure is already rising. "The three great Allies are fighting this war to restrain and punish the aggression of Japan. They covet no gain for themselves, and have no thought of territorial expansion. It is their purpose that Japan shall be stripped of all the islands in the Pacific which she has seized or occupied since the beginning of the first World War in 1914, and that all territories Japan has stolen from the Chinese, such as Manchuria, Formosa and Pescadores, shall be restored to the Republic of China. Japan will also be expelled from all other territories which she has taken by violence and greed. "The aforesaid three great Powers, mindful of the enslavement of the people of Korea, are determined that in due course Korea shall become free and independent. The United Nations at war with Japan will continue to persevere in serious, prolonged operations necessary to procure the unconditional surrender of Japan." With the exception of the specific inclusion of Korea among the Jap-occupied territories to be liberated, there was nothing in the announcement to cause any surprise in any world capitals. Most observers regard the statement as merely a word-screen to veil the intensive and specific military discussions which undoubtedly took place behind the closed doors of the important meetings. BROWN STARTS ON TOUR OF C.B.I. No different from any other plagued G.I., Joe E. Brown, of the cavernous mouth, arrived in India to be greeted by what waggish Queensway literati have affectionately named the Delhi Belly. 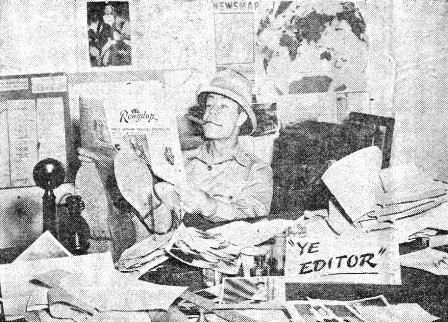 JOE CATCHES UP WITH THE HEADLINES Joe E. Brown ousted Ye Ed from his desk and caught up on Stateside news during his brief stay in Per Diem Hill, where he received his itinerary before moving out into the field for his CBI Theater entertainment tour. fired the opening salvos in what will be a month-long assault throughout the Theater to overcome CBI-landers' ennui. He entertained G.I. 's at the West India Port where a plane last week disgorged him, singer Harry Barris and sportscaster Mike Frankovich. And he followed locally by hobnobbing with bed-ridden patients of the station hospital before he, himself, was chased between the sheets. Now Brown has left Per Diem Hill, where he came briefly to learn the itinerary dreamed up for him by Theater Special Service officer Maj. John Nixon, and he is "out in the weeds" equipped with an earthy collection of witticisms and a bottle of sulfaguanidine. Preceding Brown was Don Barclay, rotund, bespectacled caricaturist, who will visit hospitals and dazzle patients with a collection of ties that resemble Hawaiian sunsets twisted into knots. Barclay, 52, will do a rugged solo. Originally, Joel McCrea was to be a team mate, but the Hollywood glamour guy turned back en route, explaining, "I'm sure they wouldn't enjoy my act." The cheers weren't long enough and loud enough for McCrea's delicately-attuned ears at several places on the aerial road to CBI-land where the actor entertained. Barclay considered that what little he might be able to do alone, however, would be appreciated, so he continued. 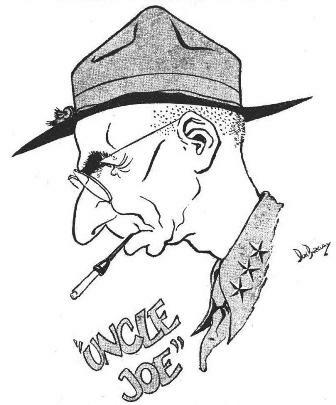 CBI COMMANDER IN CARICATURE Lt. Gen. Joseph W. Stilwell wasn't around, so caricaturist Don Barclay, who wanted to meet the CBI Theater commander to sketch his familiar features, did the next best thing - captured them from a photograph. Here's the result. Barclay is making a tour of hospitals and small units in CBI-land. McCrea is the second entertainer who failed to reach the Theater. A few months back, Al Jolson was scheduled to hop over after a tour of North Africa. Seized by illness, however, he airplaned back to the States. Local G.I. 's were later pleased to learn that the Mammy Man made a miraculous recovery upon reaching home that amazed the medical profession. So Brown now has three "firsts." He was the first big-name star to hit the Aleutians and, after shaking the icicles out of his hair, he toured the Southwest Pacific. The comedian has traveled 60,000 air miles and played to over 1,000,000 troops in approximately 550 shows. The largest G.I. audience to which Brown has ever played - a turnout of 26,000 - was at Fort Ord, Calif., where Lt. Gen. Joseph W. Stilwell was then the commanding officer of the Seventh Division. Barris was one of the Rhythm Boys, with whom Bing Crosby made one of his first steps on the road to fame. He warbles many of his own songs during the tour. Frankovich, an ATC captain, played quarterback with UCLA and was catcher for the San Francisco Missions, before making his living cooing sports chatter into a microphone. He's also a cutey, they say, at slight-of-hand. Brown was quite a figure around this hamlet for the brief spell he was here. Sporting a Henry M. Stanley chapeau and jauntily twirling a swagger stick, he made Per Diem Hill bright with humor that indicates that the men in the field are in for a treat. Oh, yes, and speaking of those annoying bacilli, they also ran rampant through Barclay and Barris. Frankovich has (so far) escaped. But the Roundup knows from sad experience he should knock soundly on wood. M/Sgt. 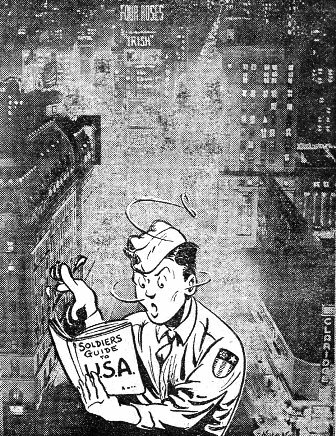 Hans Haffner guides Sgt. Curtis P. Sylvester in patching the nose of a big 'un. AIR SERVICE COMMAND BASE - Although he may not be the oldest man in the CBI Theater and there may be others with more accredited service, M/Sgt. Hans Haffner believes he holds one distinction. Haffner - "Dad" to the G.I. 's here - has an uninterrupted record of 25 years with the Army Air Forces. The sergeant donned khaki for Uncle Sam when World War I clouds first broke in 1917. He was assigned to the struggling step-child aviation branch of the Signal Corps, since grown to the swashbuckling independent Air Corps. He knew the day when engines were mounted on wooden planks. Among the first planes Haffner helped service was that of Lt. Jimmy Doolittle, now major general in command of the American Air Forces in North Africa. Haffner has seen a wide range of foreign service in Hawaii and the Philippines, besides being stationed at leading fields in the United States. His particular ability lies in metalwork and because of this knowledge he is chief inspector of such work at this air base in India. WELL, BOYS? This picture of Ava Gardner, the former Mrs. Mickey Rooney, is passed along merely as a suggestion for streamlining WAC uniforms when the weather turns hot. Any objections? Don't get us wrong, chums, the WACs look pretty to us feminine-starved G.I. 's but we aren't too CBI-atrophied to seek perfection. We, the undersigned, have taken it upon ourselves to call your attention to the heading of one of your writeups in a recent issue of the Roundup. We are referring to the article with the heading, "Medals Dime a Dozen For Sky Dragon Gang." In the first place, we are not a gang, but a smooth-running organization, and if anyone thinks that medals are thrown at us or are for sale to the first comers, we defy them to come up and try to buy a few. The medals awarded us here are given exclusively for action and not "milk runs" and we can assure you that it is a Hell of a way from being a picnic. The Roundup is a fine newspaper and we pounce upon it when it arrives here. However, we do not appreciate your belittling our exploits here in China. No doubt you will do us the honor of publishing this complaint in your worthy paper. We thank you in advance. S/Sgt. Marino R. Galluzzo, Sgt. Joseph T. Borgia, S/Sgt. Louis L. Lucas, S/Sgt. L. R. Dumas, S/Sgt. Arthur B. Smith, Sgt. Robert L. Lantz, S/Sgt. Charles M. Cox, S/Sgt. Robert Petrucelli, Sgt. Fred Dewitt, S/Sgt. Leroy Stiner, S/Sgt. Henry Ellis, S/Sgt. Lambert Rebstock, S/Sgt. Robert G. Appleby, Pvt. Edward T. Hozic, Sgt. M. S. Waite, S/Sgt. Walter J. Schefnayder, Sgt. Jack Colman, S/Sgt. Gale Cahill, S/Sgt. Golden Gallup, T/Sgt. 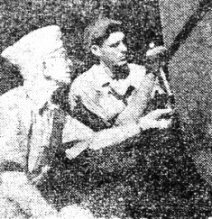 Joe Edmondson and Pvt. Douglas A. Erikson. The Roundup humbly apologizes to a unit whose guts and skill are unquestioned. In defense, however, there was no intent to minimize the deeds of the Sky Dragons, as the highly complimentary story over which the head was run, we thought, amply showed. - Ye Ed. FORWARD ECHELON HEADQUARTERS (CABLED TO ROUNDUP) - We are a long way from home, where peacetime Thanksgivings meant turkey dinner and gridiron classics, but that did not keep enlisted men of the headquarters and signal detachments of CBI Forward Echelon Headquarters from enjoying a real Thanksgiving feast and celebration with their Chinese guests and other guests from several embassies and delegations. Held Nov. 25 at the Chailing House, the dinner included almost everything in the way of "trimmings" that make for a successful Thanksgiving menu, credit for which is due to the capable arranging of Lt. F. J. McDonald and T/Sgt. Andrew Chemsak. Chemsak also collaborated with T/Sgt. Curtis Ferrell and 1st/Sgt. Martin Ross in handling transportation, entertainment and the dozens of other details which added to the success of the affair. For a number of men attending the dinner, it was their second Thanksgiving in the CBI Headquarters, and, as a special feature of the evening, a group picture was taken of those who qualified as "Second-Thanksgiving-In-China" men. They were posed with decorated "Happy Thanksgiving" cakes, which topped the excellent menu. There was a gift from the grabbag for everyone, Farrell officiating as emcee. Prior to the evening affair, men of the headquarters attended a non-denominational Thanksgiving service held in the afternoon at Assembly Hall of the Chui Ching Middle School as well as at a tea given by the U.S. ambassador at the Chinese-American Institute. OCEAN-GOING QUEEN SAILS AGAIN Against the nostalgic background of New York's skyscrapers - remember fellows? - the Normandie, recently righted, moves along the Hudson River to an undisclosed drydock, where the former French luxury liner will undergo repairs so that she may transport troops and supplies to the Allied fighting fronts throughout the world. WASHINGTON - (ANS) - Americans at home and abroad sat down to a traditional Thanksgiving festive board which, in many cases, was minus the usual turkey because of domestic shortages. Servicemen in the U.S. on furlough or leave were taken care of in private homes or through such arrangements as the one which provided 3,000 free Thanksgiving dinners for United Nations' fighting men in 145 New York hotels. While shortages of such standard Thanksgiving items such as cranberries limited the extent of the holiday fare, it was still better than that available in most of the war-ravaged world. Thousands of Americans in industrial areas voiced their thanks for war successes by working regular shifts in war plants. Ninety percent of employees showed up for duties in one New York plant where holiday work was put on a voluntary basis. Special church services and other observances throughout the nation included a ceremony at the Statue of Liberty in New York Harbor, where refugees from many Axis-occupied countries prayed for quick Allied victory. CENTRAL INDIA AIR DEPOT - A petite little miss from Back Bay, Boston, who none of them, not even her "boyfriend" know personally, has been chosen as the sweetheart of this depot by discerning G.I.'s. Miss Evelyn Fenner's photo captured the fancy of the judges in a beauty contest at "The Hangar" Red Cross club. Sgt. Wayne Simpson, a Philadelphia boy of an airways detachment, contributed Miss Fenner's lovely likeness. 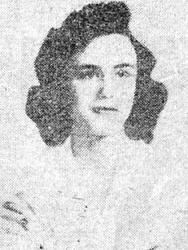 The story goes that Miss Fenner came across Wayne's picture in a yearbook among the effects he had left behind at his cousin's home in Boston before departing for CBI-land. Being attracted by his handsome, manly puss, she decided to do her part in keeping up the morale of the armed forces by writing him a letter. Things have progressed favorably from that prosaic start. CHUNGKING - (ANS) - A Chinese communiqu� has charged that the Japs have renewed the use of poison gas in fighting the stubborn defenders in the Hunan and Hupeh provinces of Central China. WASHINGTON - (UP) - The Senate passed, and sent to the White House, a bill permitting the Chinese to become naturalized American citizens and to migrate to the United States on a quota basis. The bill repeals the Chinese Exclusion Act passed between 1882 and 1913. It will allow 105 Chinese to enter the United States annually. There is an insistent hum of activity at a base "somewhere in India" where Chinese and Americans, members of a composite wing, are in the final stages of training at the CBI Army Air Force Training Command under Brig. Gen. J. B. Haddon. While P-40's skim over the field and B-25's roar high in the clouds and while servicing and minor repairs are being taught on the ground, the men of two nations are being knitted into an efficient combat team to fight side by side, against the Jap in China's skies. When the wing arrives in China, it will become part of the Chinese Air Force. When the decision is made that the Chinese are thoroughly familiar with the equipment and tactics, the Americans in the unit will be withdrawn. Whenever they get a chance, Chinese pilots brush up on their flying on either of two link trainers. 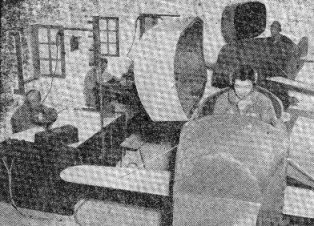 The one in the foreground is manned by Lt. Hsu Ting Chi, the other by Lt. Yi Ying Cheng. Lt. Lei Kwang Chao and M/Sgt. E. M. Davis plot their courses. An interested group of Chinese crowd around T/Sgt. 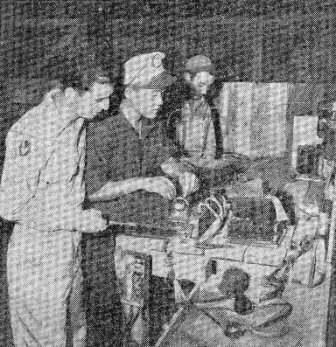 Paul F. Brown, holding a class on ground repair which, in this instance, is taking up engine change. His instruction is conveyed to the class by means of an interpreter, Capt. Li Ning, Engineering officer. Lt. Hwang Chao-Li, center, a radio technician, checks voltages on a defective radio communications receiver at a test bench in the hangar. Sgt. Anthony Puglia stands by to assist while T/Sgt. W. L. Whisenant goes about his own work. 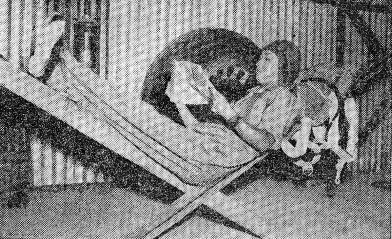 Using his parachute as a pillow, Lt. Yang E. B. carefully checks the map area of a course flight. 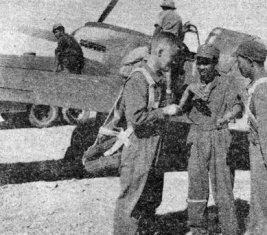 The Chinese lieutenant is typical of the type of alert, energetic pilots being turned out at the training center who will, one day, fight the Jap. After their practice flight, Lt. Coyd B. Yost, left, talks things over with Capt. Szutu F., center, and Lt. Chang S. S., both pilots of the China Air Force. Meanwhile, the plane is being refueled and tuned up for the next flight, scheduled shortly thereafter. 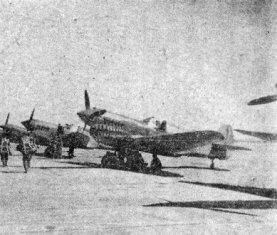 Straining at the leash, these sharp-toothed, hard-hitting P-40's wait for their Chinese pursuit pilots to lift them into the air. American squadron commanders at the base are Majs. William M. Reed and H. H. cords. Note the perfect alignment of planes. After a busy day's training, American non-coms and Chinese officers and enlisted men enjoy a spot of recreation in the American squadron's day room, which has been named "Flanagan's Bar." Capt. 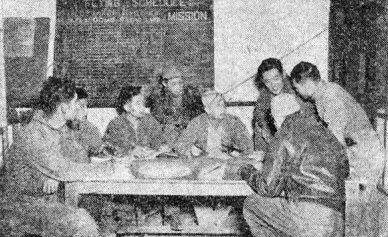 T. F. Hackleman holds a class on identification of aircraft surrounded by Chinese Air Force students, left to right, Lt. Kung S. H., Lt. Yang C. F., Lt. Chang S. C., Lt. Hsu S. Y., Lt. Chao L. P., Lt. Yang Y. K. and Lt. Keh H. S.
And shrill the alien parrot calls. Following Maj. Gen. George E. Stratemeyer's recent announcement that the air war against the Japs is about to be greatly intensified, the 10th Air Force this week made three raids on Rangoon, two of which were described as "twice as heavy as any previously made," as well as lending aerial support to Chinese ground forces in Burma. The first and lightest of the three raids on Rangoon occurred on Nov. 25, when Mitchells and fighter-bombers hit the Mingdalon airfield near the city, planting a string of bombs along the runway, destroying two planes on the ground and demolishing several buildings along the strip. Nine Jap fighters intercepted, one of which was probably destroyed. Then, on Nov. 27 and 28, the B-24's took up the job, and came over Rangoon in much larger force than ever before attempted, including two large formations of bombers with fighter cover, and on each raid dropped double the weight of bombs ever before delivered in a single attack. Since the biggest previously announced raids on Rangoon involved approximately 25 bombers and 50 or 60 tons of bombs, the weight of air fury sustained by Rangoon in each of these two raids can be roughly estimated. In the first B-24 attack, the Insein locomotive shops and engine sheds were the targets. Oil storage tanks, a welding shop, a mill and a boiler shop were heavily damaged; a foundry was gutted and the largest building in the area, housing a series of shops, was knocked out. Ten direct hits were made on tracks, about 20 cars were destroyed, and fires were left burning in storage areas. Thirty minutes after the B-24 attack, Mitchells followed up with a 10-ton raid. The next day, an equally large force of B-24's returned with fighter protection, this time to the Botatung docks and warehouses. These attacks, also, were not unopposed. In the first, seven Jap planes intercepted, one of which was destroyed and one damaged. In the second, about 30 enemy aircraft were intercepted and three were destroyed, two were probables and two were damaged. On the same day as the third Rangoon attack, four other B-24's hit Akyab, leaving large fires burning, and a fifth dropped its bombs on Kyaukpu. In support of the Chinese troops defending the supply route into Burma, 10th Air Force fighters had a busy week of strafing and bombing in the Hukawng Valley. Maingkwan, Walawbum, Taipha Ga, Haungpa and Taring Ga heard the spit of 50 caliber machine guns and the crash of bombs. B-25's on Nov. 29 backed fighter-bombers in attacks on Kamaing and Sagaing. From all these operations, six of our aircraft are missing. 14TH AIR FORCE HQS. - In addition to the history-making Thanksgiving Day raid on the Island of Formosa, 560 miles from Japan itself, the 14th Air Force continued its steady assaults in the Tung Ting Lake area in support of Chinese ground troops, blasted installations in French Indo-China and made shipping sweeps over the South China Sea. A total of 11,270 tons of enemy shipping was destroyed, 2,700 more probably destroyed and 1,800 tons damaged. Mitchells hit Yochow on Nov. 23 in support of the Chinese, smashing ammunition and oil storage dumps. 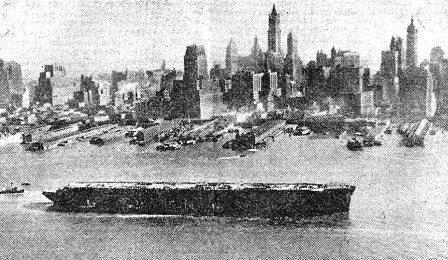 The following day, a 5,000-ton armed Japanese freighter in Amoy Harbor was severely damaged and probably sunk by Mitchells. P-40's, again in support of the Chinese, sank 20 supply boats on Lake Tung Ting on Thanksgiving and also hit 30 small enemy boats. During the next two days, 14th Air Force planes hit the aerodromes of Kiang Ling in the Tung Ting Lake area and installations in French Indo-China. Severe damage was done to both areas. At Lusang-Praband, in French Indo-China, an enemy transport on the ground was destroyed. At the same time Mitchells made a shipping sweep over the South China Sea, sinking a 350-foot destroyer, setting afire a 1,750-ton freighter and scoring near misses on a 16,500-ton freighter. On Nov. 28, fighter-bombers hit Jap installations on the west bank of the Salween River, opposite Lithaoho. At the same time, fighters attacked the town of Liang Prabang in French Indo-China, and also destroyed radio buildings and barracks on the Tran-Niah plateau. Mitchells made another sea sweep over the Gulf of Tunking, attacking and sinking a 1,000-ton freighter. No planes were lost on any of these missions. 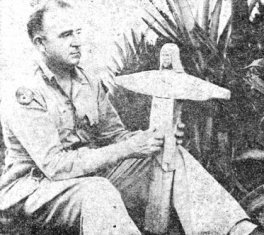 'WHITTLING CHAPLAIN' Chaplain William F. Reipschlager, the "Whittling Chaplain of India," has completed a miniature carving of Christo Redemptor to grace the chapel of an Air service Command base in India. The original overlooks the harbor of Rio de Janeiro. The news from the war fronts, and elsewhere, was terrific this week, if not colossal - and if this usually sedate writer was observed dancing an abandoned tarantella on the village green on occasions it was not because of an overdose of joy juice, as so-called friends alleged, but purely a matter of patriotic exuberance. The news that overshadowed anything else, of course, was that of the meeting just announced between Roosevelt, Churchill and Chiang Kai-shek somewhere in North Africa - newspaper dispatches say Cairo, Egypt - and the conference which is reported to be about to begin in Teheran, Persia, which will mark the first meeting of Russia's Marshal Josef Stalin with the heads of the principal Allied states. The first conference dealt exclusively with Asiatic affairs, which was the reason why Russia, not at war with Japan, was not represented. We personally doubt if anything of sensational importance was accomplished. The official announcement, to the effect that the war against Japan would be prosecuted to the bloody end, hardly stirs much emotion in this manly bosom. It would have been sensational if the announcement had said anything different. Undoubtedly what happened is that the Western Allies, England and the United States, got a complete report from Marshal Chiang Kai-shek as to China's minimum requirements for the continuation of her war against Japan. A collapse by China - not that one is expected - would be such a staggering blow to the Allied plans for eventual attack against Japan that heaven and earth will be moved, if necessary, to maintain Chinese fighting strength and morale. This may include, before too long, attacks to reopen the Burma Road and the much talked about Mountbatten offensive in Malaya. We doubt, however, if any big land operations will be undertaken in this part of the world or in the Pacific until the European end of the Axis has been obliterated. American troops in China, Iran, England, Australia, North Africa, Italy and many other scattered nooks and crannies of the globe have been instant social lions because of the wondrous foresight of the War Department in acting in the capacity of the poor man's Emily Post. All a bewildered G.I. has had to do to find the correct answer when confronted by a social emergency on a foreign strand has been to thumb through the Pocket Guide providentially issued him prior to his arrival and then act with an air of quiet dignity in accordance with what it says authoritatively here on page 19. But the astute War Department should not stop short of total victory. It should meditate at this time, if it hasn't already, on post-war planning in anticipation of that happy day when CBI-anchored troops return to the United States after their residence in the Far East. The publication the Roundup has in mind is a Pocket Guide to the United States. Imagine the bewildering plight of CBI-landers entering that strange land. They should be cautioned, for instance, about taxi drivers. The guide should advise something like this: "Don't, upon entering a taxi, bellow a belligerent 'jao' to the driver. He may not only be puzzled, but he may also hang a hard right on your schnozzle. Nor protest when he drives down the right side of the street." Then there's the problem of the natives the CBI-lander will necessarily encounter. "They are a friendly race," the booklet should inform. "Their language and customs may seem strange to you, but you must be tolerant and readjust yourself." an indigenous drink named bourbon. Reliable reports reaching the Roundup agree that it is quite exhilaration and that one is entirely capable of tying his shoelaces the "morning after." A curious meat which appears on the menu as "Kansas City T-Bone Steak" may be eaten with safety, it should be stressed. G.I. 's in this neck of the world should also be informed that it is every bit as nourishing as mutton, Spam, corned willy and Vienna sausage. Natives often help wash it down with a quaint amber liquid they call Budweiser. The Roundup also advocates considerable attention be paid to the monetary system, of which the dollar is the basic unit. There is no such thing as a three-dollar bill. They come in denominations of ones, twos, fives and tens. There are also twenties, hundreds and thousands, but only a select group of rajah sahibs despairingly called dirty capitalists by the majority of Americans are known to possess these. Americans put considerable emphasis on an object they call a mattress to help them sleep comfortably. Everyone should be told he can grow accustomed to this silly habit in short time. If a G.I. sees natives huddled in a corner of a public shop over a strange gadget with small iron balls, lights, and bells that keep ringing furiously, he would know from reading his guide book that it is a pin-ball machine. No one has ever been known to win, however, and Americans are very sensitive about it. Never comment on this fact. This United States is a very strange place, but the Roundup believes we may actually learn to like it.